The farmhouse which was the first Menninger Clinic was purchased by Betty and Don Rich and served as a bed and breakfast with a gourmet dining room. The Menninger Clinic as a sanitarium was established in 1925 with the purchase of this farm house and admittance of 12 patients. The philosophy was that mental illness could be treated with an integrated medical, psychodynamic, and developmental approach for the total health of patients. The farmhouse which was the first Menninger Clinic was purchased by Betty and Don Rich and served as a bed and breakfast with a gourmet dining room. The Menninger Clinic as a sanitarium was established in 1925 with the purchase of this farm house and admittance of 12 patients. The philosophy was that mental illness could be treated with an integrated medical, psychodynamic, and developmental approach for the total health of patients. 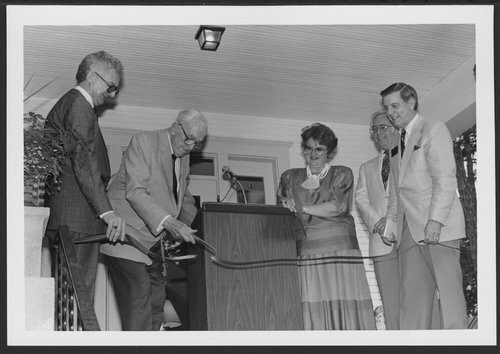 Heritage House in Topeka, Kansas - Dr. Karl cuts the ribbon to open Heritage House. Left to right -- Betty and Don Rich, the new owners, and Dr. Roy, and Merle Blair, president of the Topeka Chamber of Commerce..